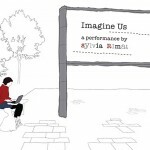 Imagine Us is a flexible outdoor performance with a playful, humorous narrative which invites a passing audience to engage and participate. The work plays with the real and the imagined, the physical and the thought spaces we pass through and is concerned with bringing public space alive. 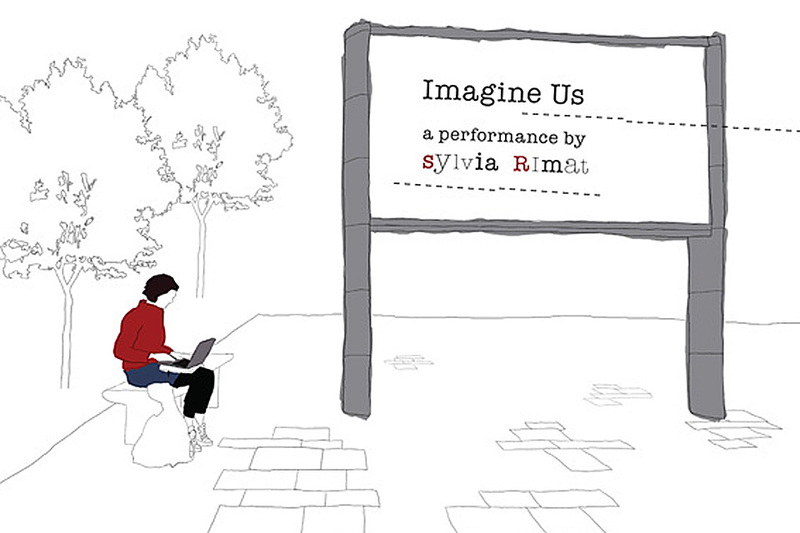 Imagine Us is a variation of Sylvia Rimat’s studio performance Imagine Me To Be There. 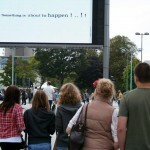 On a large screen in a busy populated area a playful narrative starts to enfold. 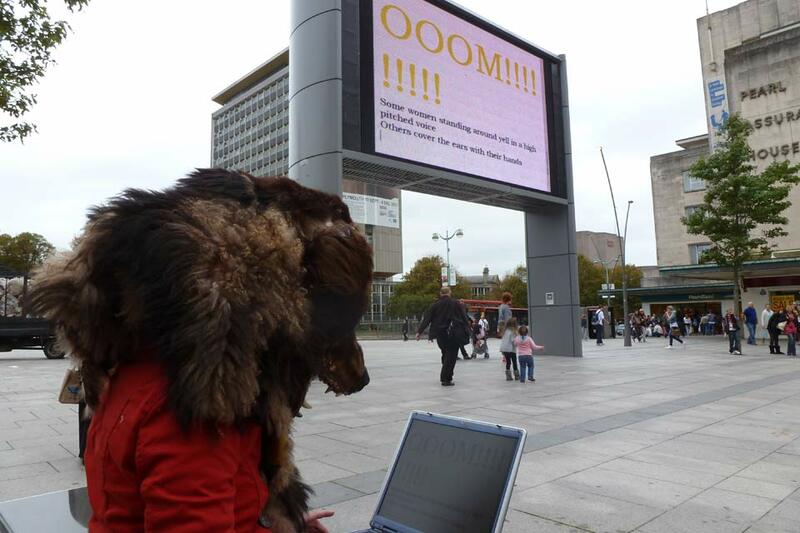 The text is typed live by artist Sylvia Rimat whilst silently sitting with her laptop adjacent to the screen. 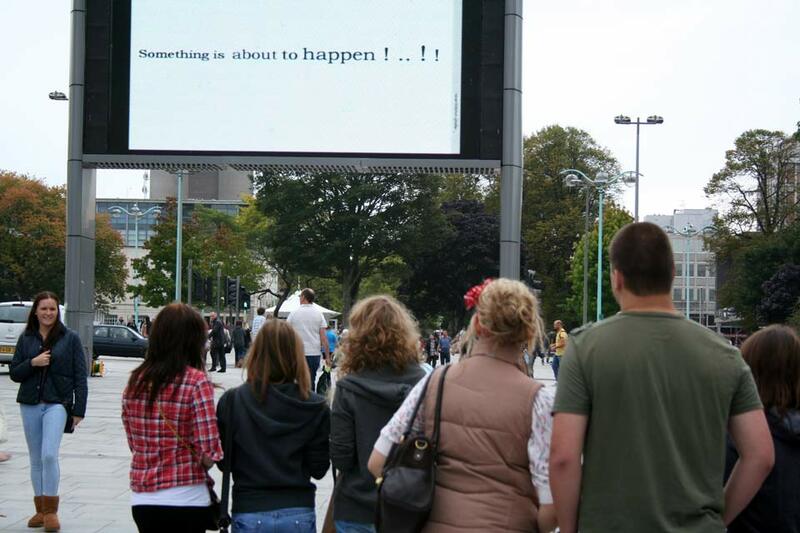 Crowds begin to gather around the screen as they wonder what the typed messages are for. The narrative written by Rimat plays with the thoughts and intentions of passers-by who are gradually being woven into her story. The unsuspecting audiences are asked, via the screen text, to step into the story, to enact the on screen instructions and slowly the audience make the imagined performance come alive. 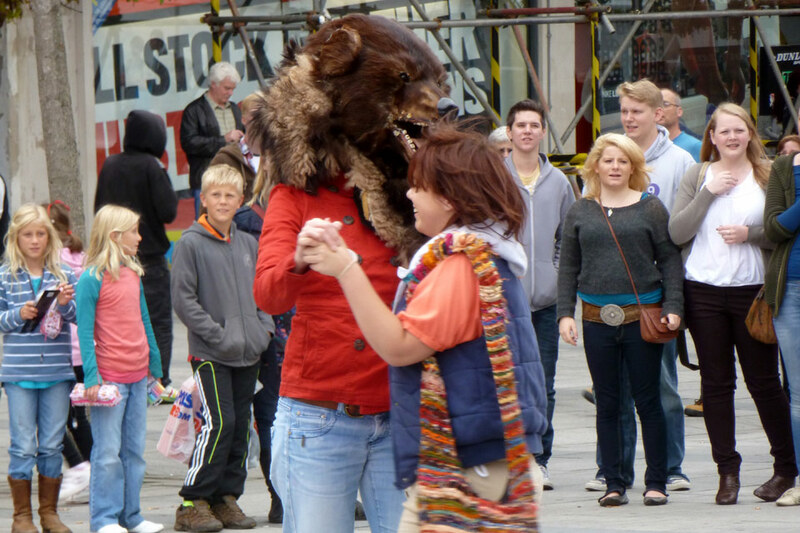 The performance climaxes with a waltz, the performer puts on a real bear head mask and dances in red high heels. 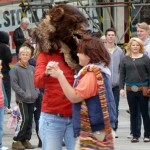 Some audiences join in the waltz, dancing with the bear and with each other. A wonderful imaginative and magical performance with the public effectively coming to a stand still to read the enfolding story on the big screen and join in the dance with the bear at the end. It demonstrates how an everyday public, that is not necessarily well-versed in contemporary art, is quite willing to engage with the unknown. It was really exciting to see how passing shoppers responded to the storyline and how easily engaged they were. The audience covered all age ranges and it was clear many of those who watched would never have gone to a gallery or theatre to see this type of performance. Sylvia Rimat succeeds in making Plymouth City Centre quirky and cool.